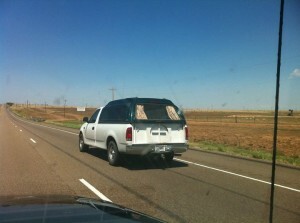 Take a close look at this "hearse" traversing the rural Amarillo landscape. I’ve spent a great deal of my adult life embarrassed to be from Amarillo, Texas. It seems like no matter where I found myself, there was something wrong with Amarillo. It didn’t start out that way. Amarillo was the big city in the Texas Panhandle, and my school — the Amarillo High School Golden Sandstorm, y’all! — was top notch. I was proud of my alma mater and my town. We cheered out our pride at AHS: “Blow, Sand, Blow!” No, I’m not making that up. Yes, the inevitable shout of “Harder” always followed it. Anyway, the first time I wavered on my Amarillo pride came only two years after my departure from the windy city that smells like cow poop. I was a student at Texas A&M. A man I didn’t know leaned over from the next table at the ultra popular Fajita Rita’s and asked me if I was from Amarillo. I’m sure I caught a few flies before I lifted my jaw and asked him how he knew. I kept my smile in place and laughed to fill the silence. “Why, thanks,” I said. But I realized this was a backhanded compliment at best as I watched the man down his margarita and hee haw with his cronies. And so I did just what any intelligent, strong woman would do, I told him to stuff it. As a young lawyer in Dallas, Amarillo was just too, I dunno, hick, maybe? Certainly it wasn’t up to the well-oiled snuff of the movers and shakers in Dallas, driving their Mercedes through Highland Park. I played Amarillo down. Way down. My parents moved away from ‘Rilla about this time, and I saw it less and less. By the time I lived in the U.S. Virgin Islands in my mid-30’s, people couldn’t place my origin. I was definitely American, or “Continental” as they called it in the islands. But other than that, my voice kept my Panhandle origins a secret. And there, I had an even bigger reason to hide it. The general consensus of the local population was that Texans were ten gallon egos up to the heels of their shitkicker boots in the stink of racism. Amarillo was like Texas to them, only a little worse. It was not an association I needed, even though they were wrong, if I was to succeed in my job and my community, sadly. They say with age comes wisdom, or at least a mellowing. Of late, I have softened toward Amarillo. I brought my Cruzan husband back to Texas, and I dragged him to every small town within a three-hour radius of our Houston home. He prodded me into attending my 25-year high school reunion last year, which was awesome. My car stereo is tuned to KILT, playing Houston’s favorite country music. I try to get my kids to understand that Taco Bell is but a pale imitation of Taco Villa, and I bore them with stories of Southwest Park, back when; I reminisce when I hear Brad Paisley sing “Old Alabama” of how I went to see Alabama at the Amarillo Fairgrounds when I was 15. When my triathlon-obsessed husband tells me our runs would benefit from hill work, I inform him that I KNOW hills, we ran up Palo Duro Canyon in cross country practice when I was in high school. And I’ve been known to slip into peench and yella occasionally, because, well, I’m from Amarilla, y’all. What is it that makes us yearn to leave home and deny our past? Or is it just me? My husband couldn’t wait to move back to his island home after college, just as soon as he could land a job in St. Croix. But I suspect many of you are like me, rueful in your maturity of the betrayal of heritage in your youth. So, where y’all from (she asks in an Amarilla accent, with an emphasis on the two syllables of from). How fast did you hightail it out of there when you got the chance? And how many of you are back there now, at least in your hearts, like me? I wish my parents were still there. We are limited to “drive bys” on the way to New Mexico or Colorado, but it’s a great over-night place. Also, Clark’s state debate tournament will be there this year, so color me there! I have to add that raising teenagers in a big metroplex REALLY makes me appreciate the small city innocence we had in our teen years. I’m sometimes sad for them in that respect. Oh man, me too. The days of our parents being able to let us roam the town freely, the security (and stifling atmosphere) of knowing people everywhere you went. Ah, the freedom. Hey ya’ll. I’m from the hills of Tennessee, born in Copperhill but raised in the burbs of Atlanta. I high-tailed it out of the south as soon as I turned 18 and joined the Air Force. And where did I end up? First, Basic Training in San Antonio, Texas and then up north for tech school. Then back to Texas…Wichita Falls for four years. Left Texas for overseas (Turkey) and then where’d I get stationed? Why, Texas of course! San Antonio again. So I kinda feel like I have two homes, Atlanta and San Antonio. And no, I’m in Vegas now and have no plans to ever live in or near Atlanta again. Or Texas. If I move anywhere, it will be either Boise, Idaho to be near older son or Orlando to be near younger son. Only time will tell. Right now, I really enjoy living in Vegas. Did you ever go back to Tennessee? I joined the USMC and left at 17 years old. Other than a 3 month stint living there in the early 90’s, I have only been back to visit family. I was stationed in the Far East and was amazed at how many people around the world have heard of our little home town. After I had been gone for a few years and called to talk to old friends their accent was what stuck with me most after our conversations, yet every one I met immediately pegged me as a Texan. I thought there was no way I still sounded like my friends on the other end of the line. Still after having lived in Amarillo for 17 years and being gone for 27, it still consider it home and have a warm and fuzzy feeling as I drive up 287 and begin to salivate like Pavlov’s dog when I hit Washburn. The biggest decision at this point is if I am going to stop at the first Taco Villa on I-40 or hold out till I get to Coulter. My dad just retired and moved to Granbury and I hit me that he is the last Jones to leave Amarillo and other than the “drive bys” I no longer have a reason to visit. That’s awesome that you are a Marine! My brother Paul is also one, and there are lots of other good Sandie Marines, ie Darren Wheeler. Anyway, I digress. That’s amazing that people in the Far East have heard of Amarillo. Besides Taco Villa, I also always hit Donut Stop, btw, oh my thighs hate me after. I (as you know 🙂 ) am a crucian and I have to say I had at least some of the anti-Texas bias that you talked about from living in the islands. Moving here has opened my eyes (and ears) in so many ways. People ask me all the time “how could you possibly move from the islands”…. well… as much as I love the VI and it will always hold a very special meaning for me….imagine living in a little town somewhere but NOT being able to jump in a car and drive away. I LOVE living in Houston, AND, I know that I will love living wherever else we will live in the future. Its soooo much about taking advantage, AND SEEING THE GOOD, in wherever you are. It also really matters who your living there with :). I now have a pair of boots, am learning to two-step, have an appreciation for country music (although I will never give up RocknRoll) love armadillos, BBQ, small texas towns, straight roads that stretch out for miles and all of the really nice people that live in this state. I had a GREAT time at Pamela’s high school reunion, the people were so nice to me, and seemed to care so much about each other. it was very cool. Sorry I am rambling, but I love this post. You have really had a turnaround. You had a real anti-Texas, anti-A&M, and anti-Pamela bias as I recall 😉 It’s been entertaining to watch you learn to enjoy ALL of it. It snuck up on you. And you are a shameless country music fan now. It’s embarrassing, really. You, a rock bassist, slapping your steering wheel to Blake Shelton, Brad Paisley, Tim McGraw, Dierks Bentley…the list is very, very long. Oh my. And you were great at my reunion. YOu were the reason I even WENT to my reunion, and you, veteran of 3 high schools, didn’t go to any of your own! Your story reminds me of the movie “Sweet Home Alabama”. I’m from a city in Canada that I just can’t seem to take any pride in saying it’s where I’m from…..so I guess I’m another victim. For me there’s a lot more to it, but this gypsy soul of mine just won’t allow me to call anywhere than where I am right now, home. I didnt know you were inthe air force,did i? OH and I forgot – GREAT POST! I like how you pulled all that together, taking us a trip all the way back to Amarillo – I liked visiting it way back when! And I LOVED Taco Villa – way way way more than Taco Bell. I liked Taco Tico, too. Don’t be ashamed of your hometown. You’ve got great memories there. You had pride and spirit for your high school. You probably knew it like the back of your hand. Every place on earth has it’s downfalls and people aren’t ashamed to let you know it when they find out where you’re from. I tell people I’m from Cranford, NJ and all I get is “oooh”. Worse yet, the SOUTH side. OMG, that was the “poorer” side of town. No, it was the “older” side of town. Sorry that my 50’s style split level, cookie cutter house wasn’t like your center hall colonial on the “north” side of town. Where I’m living now hasn’t even heard of Cranford. Just being from New Jersey is enough to be scorned. You “city slickers”, “you people from NEW Jersey” is what I get or over hear. My poor kids are doomed to go through life having to tell people they graduated from NAZARETH HIGH SCHOOL, a goody goody, lousy football team, falsely well acclaimed institution that doesn’t talk about the drug problems they have. They really do resent moving. My husband and I can never live that down. When someone says “I’m from Manhattan, New York City” and says it like it’s the best place on earth, I immediately think, “oh you poor thing”. See? Everyone thinks totally negative when they hear about other people’s origins. You can’t take it to heart. Hey, “Amarilla By Morning” is one of my favorite songs. At least you have a song about your town. So be proud! Screw everyone else that doesn’t think highly of it. Where are THEY from? Is it really that much better? That was good Pam. I think everyone feels that way about either their hometown, or certain members of their family or friends from their past at some point in their lives. (I know I have) I think it’s great to get to the place where you cannot only accept it but embrace it all and know that’s a part of what made you— wonderful you! :o) — heritage -it’s more important the older we become. Heritage does seem to become more important to me every day of my life. Great article, Pamela. I lost most of my accent so the folks out here in CA could understand what I was saying. 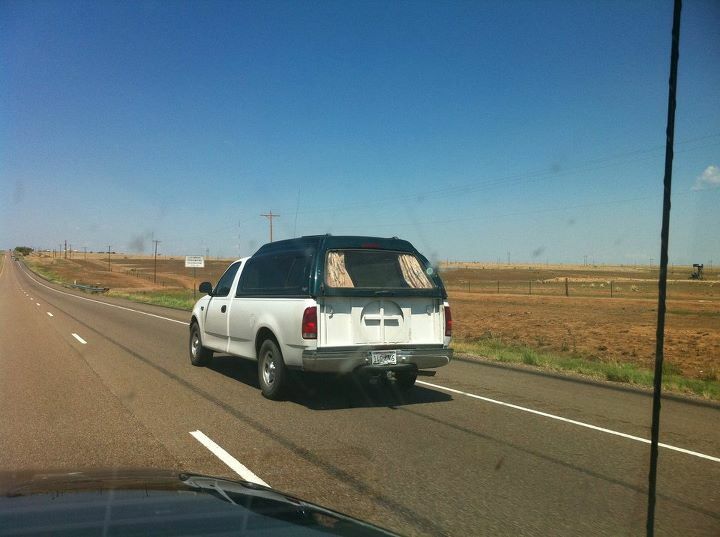 But, the odd thing is that I am never embarrassed to be from Amarillo. It makes me, me. My husband pointed out recently that soon I will have lived in California longer than Texas, so then I will be a Californian. No way, I say. Once a Texan, always a Texan! I can’t believe you ended up in CA all these years (I was in LA last week, and the weather was lovely, btw). Come home and work on your accent with us! Oh, I love that story!!! 🙂 And I am jealous that Eric got to visit the Bay of Fundy on work, I really want to go. Just think of your accent if we had stayed in DeLeon! Amarillo is great town. But for the wind I could still live there. I know, it is a great town. Our “Roots” make us who we are. This is the reason you are sooooooo cool, down to earth, honest, & interesting. ’tis true — which is what I loved about my high school reunion last year — to see other people who became something similar to me because of where we were from. nature v nurture — they both count! Oh, the reminiscent thoughts of home, brought about by a well-written blog post. In my case, I get homesick for the scenery. I grew up at the foot of a 14,162-foot mountain in very rural, very northern California. We had no glowing city lights, or even regular street lights, for that matter. I could ride my bike up one of several steep hills to get a 360-degree view that included a lake, a golf course, some desert, some forest, mountain ranges, and that one big mountain. My sister and I made forts and houses in the bushes and trees near my home. I miss that. When I went off to college, I suddenly had my choice of going anywhere. But I’d expected to stay in that town, so I picked the university that was closest to home. Even though my family moved away, I went back “home” regularly. But each time, I began to realize that I’d changed. Visits grew fewer. I went to a high school reunion and realized that I missed the memories of happy times, but not the current town or the memories of not-so-happy times. I passed through a year ago and stayed the night, and Facebook has actually gotten me back in touch more than any other means. In the process, I’ve seen how much my beliefs and views of the world have changed, and how much I do not fit in my hometown. And I’ve realized that I’ll never move back. Ya know, I’d never move back either. Really though the town I always thought I’d move back to is Buffalo, Wyoming, the love of the childhood. (We didn’t move to Amarillo until I was 12). But when I’ve gone back…ugh…it’s a great place to visit, but not for me. Thanks for stopping by, Layla. Sometimes I wish I’d just kept the good childhood memories and never gone back. It was such a shock to see that my play “house,” a couple huge bushes with a tunnel and “rooms” in them, was gone. Oh well. I could have written this post, except that instead of Amarillo, it was upstate S.C. I remember being mortified as a college freshman when an upper class guy made fun of my accent…. What goes around, comes around, and all that. Truly. It does. I think one of the chinks in my roots-denial broke down when I realized my teenage daughter who is mini-me and who wants to be like me no matter how she argues against it (they don’t know how obvious they are) started listening excllusively to country music and announcing she wanted to drive a monster truck. OMG, little teenage Pamela ha ha. Of course, I also listened to Def Leppard and Loverboy….(Loverboy!). This post seems to hit home to a lot of people, which is both cool and understandable. I love that so many have jumped in and left comments regarding their stories. Good stuff. Great post Pamela! Everytime I’ve visited Texas (mainly the hill country) I’ve always felt welcomed, small, and hungry for good BBQ. If I wasn’t a true blooded Michigander (by the way, my grandpa would say, women are Michigeese) then my inner redneck self would claim the Lone Star state as home. Being a gullable, free spirited, semi-rebellious teenage know-it-all living a totally free life in America’s Paradise with a tolerable yet very cool and understanding father, was the ultimate place for any gullable, free-spirited, semi-rebellious teenage know-it-all to live and play and not get grounded! Like all good things though, they must come to an end. My end happened in the summer of 1979. I came down with rock fever and before you could say “Schools Out Forever”, the Caribbean trade winds blew me off course, off St. Croix, and smack dab in the middle of a 22 year adventure where home was where ever the Coast Guard sent you. Funny how if you let the winds of change and growth and life take over, the adventures have a bigger impact, a deeper meaning. It’s been written many times that it’s not necessarily the destination but the journey, well….there is total truth to that saying, at least in my experiences. After 22 years of guarding our coasts for democracy, packing up for yet another move (typically every 3 or 4 years) to satisfy the needs of the government, it was time to put down some roots. But where would I call home, home? Michigan? Florida? St. Croix?, or a number of other locations where I was stationed? For me, the winds of love and marriage made my decision easy, so the Golden state is where I hang my 10 gallon hat Ya’ll. Happiness is a good state to live in! I’ve been here for 18 years now…the most I’ve ever lived in one location. My spider sense tells me the winds of retirement will eventually pick up and well, who knows …maybe we sell all our stuff, buy a boat, keep the dogs, and hoist the sails…homeward bound. Steady as she goes! Oh man, I kinda got teary reading your comment! That would be pretty awesome if you guys and the dogs sailed around the world. And, while it might have been love/marriage that pulled you to CA, you got a sweet sweet life there, ya know? I’m from San Angelo, TX. Since I was young I was an accent snob. Never really liked the sound. However, when I’m tired, watch out, y’all. I had a bus driver ask me where I was from. When I said Texas, he laughed. He said, “Every other American I’ve asked says America. Oh, P.S. I’m not a racist. Gosh, your post brought back memories. I too have been accused of saying “peench”. I college I had a boyfriend from Kansas and he picked out all my special Panhandle pronunciations. Dallas does take away a bit of that but when I go back to Clarendon for a few days (or to Paul’s hometown of Tyler) the drawl gets a little longer and the accent a little stronger. By the way, I was at that Alabama concert too! I was too young to date but I think I got to go because I went with my “date” and three other couples. Hum, I bet that 8-track is still in my room in Clarendon somewhere………..along with Air Supply and Journey…. I enjoyed your post Pamela! Somehow I never got the accent. When I go to NYC, folks think I’m from Boston. WTF? LOL, you look like you could be from Boston too. Not a typical Texan looking guy.